In women’s college basketball, the UCONN Huskies are currently on a 75-game winning streak. That extends back to winning the championship LAST season and finishing undefeated. Well, they just needed one more win to advance to the Final Four. Their next competitor: #3 seed Florida State. Unfortunately for the Seminoles, UCONN had no intention to take it easy. The Huskies routed Florida State, extending their win streak to 76-games, and putting them just two games away from completing two straight undefeated seasons. This… is pure dominance. UCONN 90, Florida State 50. Elsewhere in college basketball, St. Johns is looking to revive its program. For those that don’t remember, St. Johns used to be a major player in the Big East during the 80s. They had a decent 90’s run, and pretty much disappeared this decade, short of a Final Four appearance when they had current Laker Ron Artest. Now, they have pinned their hopes and dreams on former UCLA coach Steve Lavin. Lavin has been out of the coaching circuit for awhile now, doing a lot of broadcast work, but hopefully he can return St. Johns to premium ranks next season. Finally, in an update from Monday, it appears that there is NO frontrunner in the Donovan McNabb trade talks. The Raiders had emerged as a very potential landing zone for McNabb, but as of yesterday it appears that McNabb may be an Eagle at least until draft day. Experts predict that he will be packaged for some draft picks, and if this is the case, the number of potential teams definitely increases. The Bills, Raiders, Buccaneers, and Redskins could all use a quarterback. Fresh off making the Final Four for the second straight season, Michigan State coach Tom Izzo is in high demand. But… from whom? It appears that the University of Oregon is looking to re-invent their program. They want to be a powerhouse on the West Coast. 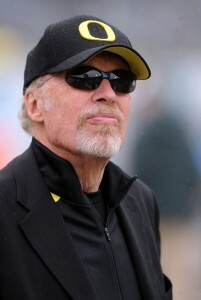 This is highly supported by Nike CEO Phil Knight, who is a huge backer of Oregon. Investing in a top coach like Tom Izzo would immediately draw recruits and ideally turn the Oregon Ducks into a Top 15 team every year. With all that said, Tom Izzo said that nobody from Oregon has contacted him yet. And in the NBA, the New Jersey Nets were hoping to avoid going into the record books as the worst NBA team of all time. They only had 9 wins, and that would tie the worst record of all time. 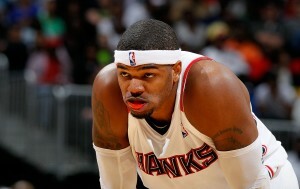 But, they needed to beat the San Antonio Spurs who have looked very sharp lately. Well, the Nets came to play, and actually looked incredibly tough. It was as if they found their groove. Brook Lopez had a monster game with 22 points and 12 rebounds, as the Nets topped the Spurs for their 10th win. They don’t have to worry about the smell of being the worst NBA team ever. New Jersey 90, San Antonio 84. Finally, it seems like the Oakland Raiders are finally getting serious at quarterback. 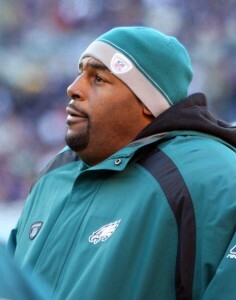 According to inside sources, the Raiders are pursuing the Eagles Donovan McNabb. Sure, McNabb is up there in age, but he still looks good in Philly, and with Brett Favre’s 40-year old success last season, the Raiders think that McNabb might actually give them a chance to win. Remember, the Raiders have a very good defense. If they could just get a little offensive productivity, and, more importantly, not mess things up down the stretch, they could probably put up some wins next year. The playoffs might be too much to ask, but at least they’re trying to give their fans a good product to watch. Well, the Final Four is… FINAL. 4 great games over the weekend decided this year’s illustrious combo. First up, it was #5 Butler vs. #2 Kansas State. Kansas State survived a thriller against Xavier to get to the Elite 8, but that might have taken the wind out of their sails. Butler came to play and wasn’t afraid of the bigger, tougher Kansas State team. Kansas State made a late comeback, but it wasn’t enough, and Butler advances to its first Final Four ever. Butler, by the way, is in Indianapolis and thus will be playing their next round at home. Expect the arena to be packed with Butler supporters. Butler 63, Kansas State 56. Then, it was the #1 seed Kentucky vs. #2 seed West Virginia. 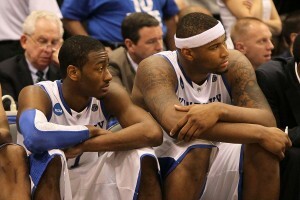 Kentucky was heavily favored given their extremely talented team — namely John Wall and DeMarcus Cousins. They will probably both be Top 3 picks in this year’s NBA Draft. But the Wildcats haven’t been playing their best basketball lately. West Virginia on the other hand had something to prove. And they had the leg-up in this game the entire way. Kentucky simply couldn’t get it together. They made a small comeback, but the Mountaineers just kept pounding on them. In the end, WVU prevailed and is headed back to their first Final Four since 1959. That’s a huge victory for the state of West Virginia. WVU 73, Kentucky 66. And on Sunday, it was #6 Tennessee vs. #5 Michigan State. Tennessee has jelled at just the right time, and beat #2 Ohio State on Friday. Michigan State on the other hand struggled against Northern Iowa (then again, Northern Iowa beat Kansas). This game was neck and neck the entire way, but Michigan State got the defensive stops when it mattered and eeked out a victory against the Volunteers. The Spartans are headed to their second straight Final Four appearance. But can they win it all this time? Michigan State 70, Tennessee 59. Finally, it was #1 seed Duke vs. a rolling #3 seed Baylor. This game was positioned as anybody’s guess. Both teams were playing extraordinarily well, and it was positioned to be a battle for the ages. Well, that’s exactly what it was. Hard fought and close the entire way. Only 1 and 2 point lead shifts. Finally, in the last 2 minutes, Duke got some lucky breaks and with a few quick 3 pointers suddenly had a 7 point lead. Baylor couldn’t claw their way back in, sending the Duke Blue Devils back to the Final 4. While Baylor fell short, this tournament cemented the fact that a previously dormant Baylor basketball program is BACK… and alive and well. Duke 78, Baylor 71. Elsewhere in the NBA, the Boston Celtics had the exact same situation. Win and clinch a post-season birth. And they too had a tough match-up to get it done: The mighty Denver Nuggets. Well, the shimmering gold of the Nuggets didn’t phase the rejuvenated Celtics one iota. Carmelo had a nice night for Denver with 32 points, but the Celtics looked fantastic and beat up on Denver the entire game. Paul Pierce led the way with 27 points, and the Celtics earn a trip to the post-season. Suddenly, the Celtics look like a championship team again. Boston 113, Denver 99. And March Madness kicks back in with the Sweet Sixteen. #2 West Virgina has had a fantastic season and looks great in the tourney. 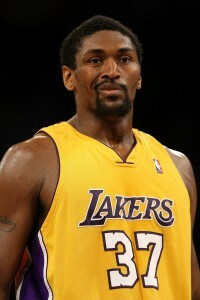 However, they got some bad news last game when their point guard Daryl “Tuck” Bryant broke his foot. He’s out for the remainder of the tourney, and without the leadership of a point-guard things will be tough for WVU. They take on a fierce Washington team that may sidle into the Elite 8. And the featured match-up of the night will be #1 seed Kentucky vs. #12 seed Cornell. Kentucky is the favorite to win the tournament now that Kansas is out. But there is a lot of talk that Cornell could pull the upset. Cornell is a very talented team and they play tough, really tough. Plus, Kentucky and Cornell play two completely different styles of basketball, so there’s no real way to predict how they will match-up. Kentucky has 3 future NBA players, but Cornell has their own Big 3, and those guys are just as good as any 3-player combo in the country. This one will be a thriller to watch. In the NFL, a major rule change. There has been much gripe over the years about the NFL’s Sudden Death overtime system. Currently, here’s how it works. If the game ends in a tie, there’s a coin toss, and the first team to score wins the game. Therefore, if the team that wins the coin-toss kicks a field goal, the game is over — the other team doesn’t get a chance. Well… that’s still how it’s going to work, except for the playoffs, when there is a lot more at stake. So here’s the new rule. There is a coin toss, and the winner can still win the game outright with a touchdown. However, if the the team only kicks a field goal, the other team will get a chance to win the game with a touchdown or tie the game again with a field goal. If they kick a field goal, then the game goes to sudden death on the next possession. This creates new drama and new strategy in the NFL. The reason the NFL is the most profitable and popular is because they adapt to fan and player gripes. They try to always keep things interesting. Only recently did they add the 2-point conversion because it added a new element of strategy to the game. You have to give this league credit for keeping us entertained year by year. Elsewhere in the NFL, there was talk that newly acquired Brady Quinn might compete for the starting job with the Denver Broncos, even though they already have Kyle Orton. This always creates a compelling off-season debate and QB controversy. However, Broncos coach Josh McDaniels came out and publicly stated today that Kyle Orton is the bonafide starter for Denver. This is a good thing because it allows the entire offense to know which player they can expect to call the shots. This is better for team rhythm and chemistry and the media doesn’t crowd the clubhouse with speculation and secretive drama as to the starting Quarterback. Smart coaching move from McDaniels. Finally in the NFL, with the release of long-time star running back Brian Westbrook, the Philadelphia Eagles were looking to get some help in the backfield. They will have 2nd year man LeSean McCoy taking the bulk of the carries, but they just added one of the heroes from the 2009 season. 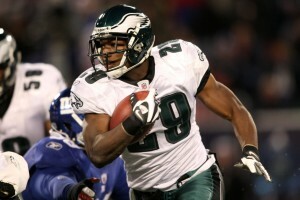 Mike Bell, the surprisingly effective running back from the New Orleans Saints will join the Eagles squad next year. This gives the Eagles a very dynamic rushing attack to go with their high-powered aerial game. They could be a very exciting team to watch next season. With March Madness on hold until Thursday, the action was in the NBA. In Oklahoma City, the Thunder were hoping to hold off San Antonio to prove to the world that they can hang with anyone. The Thunder will probably nab the #6 seed in the playoffs, but they do not intend to go quietly. Well, Kevin Durant simply WENT OFF. He put up 45 points on the night. However, the Spurs look faster and quicker now that Manu Ginobili is back to full strength. And with his 21 points, the Spurs were able to hold on for the win. Now the Spurs move into the #6 seed, putting the Thunder at #7. No problem, but they definitely don’t want the dreaded #8 seed — that’s a first round date with the Lakers. San Antonio 99, Oklahoma City 96. Elsewhere, Phoenix headed to Golden State for an offensive shoot-out. These teams can put up points, and when the Warriors are at home, they just let it rain. The Warriors are a very bad team defensively, so their game strategy is to quickly run the floor and score, score, SCORE. Thing is — they don’t really care if you score, because they intend to outscore you. Therefore, teams they play tend to let down their guard on defense because it’s a lot more fun to score than to play hard defense. 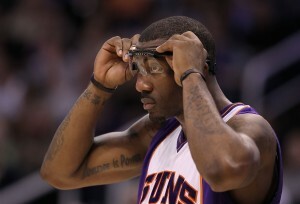 Well, last night, the Suns put on a show with Amar’e Stoudamire going for 37 points, and Jason Richardson for 34. The Warriors kept it close, however, with a 30 point game from Monta Ellis. 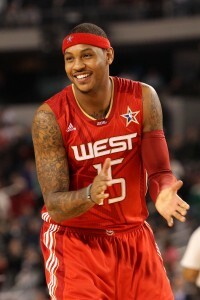 But in the end, the Suns had that extra bit of gusto that gave them the win. Phoenix 133, Golden State 131. Finally, the Men’s March Madness may not resume until Thursday, but the Women’s Tournament is in full swing. And last night, they had their first major upset. #7 seed Gonzaga took on #2 seed Texas A & M and brought it all to the table. Vivian Frieson took control for the Zags to advance to the sweet sixteen. This has been an insane year for upsets in college basketball. But that’s why they call it “Madness”. Gonzaga 72, Texas A&M 71. Whoa — what a crazy weekend in March Madness. Because that’s exactly what it was… MAD! To start things off on Saturday, #2 seed Villanova took on #10 Saint Marys. Villanova heavily struggled against #15 seed Robert Morris in the first round, and Saint Marys is a tough squad. Well, Saint Mary’s held the lead throughout, until, at the very end ‘Nova came surging back. They’re used to playing soft most of the game, and then winning it at the end. But this time, that strategy didn’t work. Saint Mary’s hung in there tough and eeked out the upset. Saint Marys 75, Villanova 68. And later, it was the game that will be remembered for decades. Heading into the tourney, Kansas was the most favored team BY FAR. Nearly 85% of America’s brackets listed Kansas as the winner. They had a terrific team with most likely 6 future NBA players, plus the coaching experience to go with it. Sure, there was that potential matchup with #2 Ohio State and Evan Turner looming in the Elite 8, but the Jayhawks would deal with that when the time came. They NEVER expected to have their hands full with a ferocious Northern Iowa team. N. Iowa was up the entire game, but Kansas started pressing and got the game to within 1 point with just under 2 minutes left. Usually the little teams cave when the big boys come back, much less the juggernaut Kansas. But Northern Iowa just kept attacking, and with just under 30 seconds they hit a dagger 3 to essentially ice the game. The ship… has sunk. #1 Kansas went down, along with the majority of people’s bracket picks. Northern Iowa 69, Kansas 67. And finally, the upsets weren’t done yet. #4 Wisconsin was hoping for an easy win against #12 Cornell. They’re an Ivy League bookworm school, right? How much harm could they do? Thing is, most experts felt Cornell was seeded way too low. Remember, Cornell went into Kansas earlier this year, and only lost by 4. Isn’t that an indicator that they don’t mess around? Well, now they had something to prove. Cornell had their way with the Badgers and defeated them with ease. Next up for Cornell, John Wall and mighty Kentucky. And after Northern Iowa defeated Kansas, it’s pretty clear that anything can happen in this year’s tourney. Cornell 87, Wisconsin 69. March Madness was in full swing yesterday. Here were the choice highlights. #7 seed BYU took on #10 seed Florida in the first game of the day. This game was back and forth the whole way and needed not one but two overtimes to be decided. 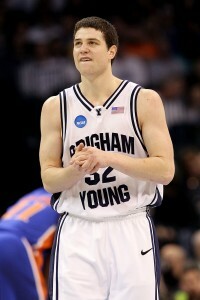 And in the second overtime, BYU simply tookover behind an incredible performance from BYU standout Jimmer Fredette (a name to watch in this tournament). He scored 37 points on the night as the Cougars edged the Gators. BYU 99, Florida 92. Later in the afternoon, the mighty Big East conference took the floor. Their representative: Villanova. Villanova is a #2 seed and hoped to win an easy game against #15 Robert Morris. But boy did they have their hands full. Robert Morris led almost the entire game, but Villanova had a late surge to tie the game and send it to OT. For some reason, whenever lower seeds have a big lead, they get nervous and can’t protect it. In OT, Villanova finally became Villanova and edged out Robert Morris. But a sloppy start for the Big East conference. Villanova 73, Robert Morris 70. And… things would get worst for the Big East. #3 seed Georgetown took the court next against #14 seed Ohio. This was supposed to be an easy win for Georgetown, but Ohio was hot from the gate. They led Georgetown the entire game, but unlike Robert Morris… they didn’t let up when Georgetown turned on the gas. Nope, Ohio just kept on scoring. Armon Bassett was the hero for Ohio with 32 points, as they rolled into the second round. Can they win one more and head to the sweet sixteen? Ohio 97, Georgetown 83. 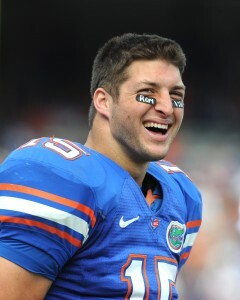 In college football, even though he won’t be a first round pick, Tim Tebow has been the talk of the draft. Sure, Tebow is one of the best college players of all time, but many don’t think his game will translate to the pro-level. To add to this, Tebow didn’t even perform well on the Wunderlich test (which assesses quarterbacks intellectual abilities). Vince Young was famous for failing this back in 2006. 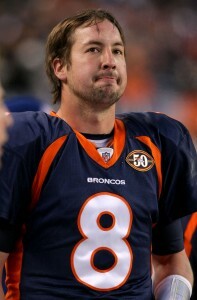 Nobody knows who will nab Tebow or how long he will stay in the NFL. However, that didn’t stop the league from inviting him to the draft. This… will be awkward. Tebow can probably expect at least a few rounds to go by before anybody calls his name. This means that the cameras will constantly do updates on him, and it should be nothing but embarrassing for him and his family. Let’s hope SOMEONE takes him so he doesn’t become the first player at the draft NOT drafted. And in the NBA, the Cleveland Cavaliers were hoping to win an easy home game against Indiana. If they did, they would clinch the Central division. But the Pacers wouldn’t make it easy. In fact, they led most of the game behind stellar nights from big men Troy Murphy and Roy Hibbert (19 and 20 points respectively). 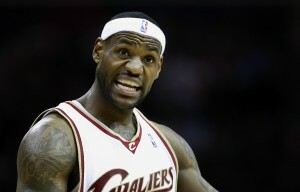 But then, LeBron turned into LeBron and went into “There’s no way we’re losing this game mode”. He finished the night with 32 points as the Cavs powered back to beat the Pacers. The win gives them the Central crown, and they will most likely nab the #1 seed soon. Cleveland 99, Indiana 94. Finally, today marks the start of March Madness. So make sure you fill out your brackets. Of course, nobody can complete a perfect bracket, but the odds on favorite is Kansas. They’ve got, most likely, 6 future NBA players, and were ranked #1 for most of the season. However, Kansas is easily in the toughest division, which includes #2 Ohio State (home to the NCAA player of the year, Evan Turner) and #3 Georgetown (who was an early season favorite to make the final four). This year is going to be fun! It’s pretty close to official that Tiger Woods has decided upon a comeback day. It looks like Tiger will be joining the best of the best for THE MASTERS. He’ll have the next month to practice and get back into top form, but it’s curious to see whether he’ll be… good. How will the field accept him? Will they boo him? Will anybody applaud if he hits a 12 foot putt? Remember, he never got truly injured physically, except for his minor injuries suffered during his car accident. He’s still the same dominant Tiger. The question is… can he keep himself together mentally, as golf is just as much mental as it is physical. Concentration is paramount. This will be fascinating. And in the NBA, the Denver Nuggets were looking to get back on track after losing a nail-biter to Houston. It wouldn’t be too hard either, as they played host to the lowly Wizards. The most notable aspect of this game was their coach, George Karl, was back on the sidelines. He had to go through several cancer treatments during their road trips, and the team was happy to have him back. Carmelo Anthony put on a show for the Nuggets crowd, posting 29 points and 12 rebounds, and the Nuggets truly look like a championship contender right now. Watch out Lakers! Denver 97, Washington 87. Finally, yesterday was the annual first game of the NCAA tournament. Um, yeah, most people don’t know that. For the past decade, the NCAA has allowed 65 teams into the tourney, with a play-in game on Tuesday between the 2 worst automatic bids. This year that distinction went to Arkansas-Pine Bluff and Winthrop. It may not be a big deal to us, but to these little guys, it means everything. Well Arkansas-Pine Bluff came to play last night, and got a solid 14-point effort from Allen Smith. They beat Winthrop handily, and now get to go the REAL Big Dance. Their prize… #1 seed Duke. Can they be the first #16 seed to beat a #1 seed? Arkansas Pine-Bluff 61, Winthrop 44.